The North American International Auto Show (NAIAS), better known as the Detroit Auto Show, is one of the largest automotive shows in North America and annually features many national and worldwide introductions from the world’s most renowned auto manufacturers. Perennially held at Detroit’s Cobo Center, the 2014 NAIAS showcased the industry’s latest innovations to more than 800,000 attendees over the course of nine days. As a critical component of the show’s experience, over 1,400 of HARMAN’s Martin Professional lighting fixtures were deployed across the entire show, including booths for Chrysler, Nissan, Infiniti, Ford, Lincoln, Acura, Volvo, and more. Chris Wojcieszyn of Lighthaus Design teamed with Bruce Spillman, Onsite Lighting Designer, who oversaw the execution and focus for Chrysler’s 2014 NAIAS booth, to develop a lighting design for the booth which also featured Fiat, Dodge, Jeep, Ram, and SRT. Wojcieszyn used 270 of Martin’s MAC 2000 XB Wash lights with super wide lenses to create an even white wash across the booth’s exterior, which consisted of large flat white walls on three sides. Spillman and Wojcieszyn also deployed 81 of Martin’s Viper Wash DX luminaires on all the featured vehicles on revolving platforms across the booth. Chris Wojcieszyn was also the Principal Lighting Designer for the 2014 Acura booth, which featured 138 of Martin’s MAC Aura Wash lights. The booth featured two suspended rings that twist throughout the entire space, one made of silver and the other wood to represent man and machine. 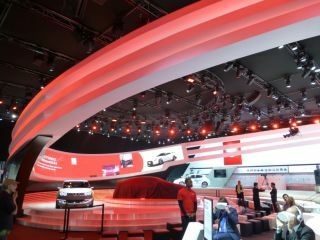 Principal lighting design for the Nissan booth was developed by Chris Medvitz of Lightswitch and included 52 Martin Viper Wash DX fixtures to light the key vehicles for press events and reveals. Additionally, Medvitz used 90 Martin MAC 2000 Wash XBs to light the booth’s signature architectural feature or ‘halo’. Medvitz also served as the principal lighting designer behind the 2014 Infiniti booth where he deployed 10 Martin Viper Wash DXs and 84 of Martin’s MAC Aura fixtures to provide light for VIP lounges, highlight corporate logos, add color and movement to the press event, and even light a DJ featured on the booth. Additionally, Medvitz used 24 MAC Auras on a circular truss to light the new Infiniti Q50 Eau Rogue concept car. “The Auras created an extremely smooth and soft wash for the concept vehicle that allowed us to fine tune color and color temperature to make the red paint on the vehicle appear the way our clients wanted both on camera and in person,” commented Medvitz. Lighting Designer Jonny Milmer of Imagination used 166 Martin Professional MAC Aura, 12 MAC 700 Wash and four MAC III fixtures for lighting of the feature vehicles on both the Ford and Lincoln booths. For Ford, Milmer used the MAC Aura to light both the featured vehicles and the key interactive display due to its light weight, speed and light versatility. “We needed a fitting that could match the daylight lamp from the Static Daylight Pars while creating full color sequences to help tell the design and production story,” explained Milmer. For the Lincoln booth, Milmer chose the MAC Auras to light the feature vehicle on the center revolve stage due to its clarity and the consistent color temperature it produces. Developed by Robert Cangemi, Principal Lighting Designer of Cangemi Design, the lighting design for Volvo’s 2014 NAIAS booth featured 72 of Martin Professional’s MAC Auras, 16 MAC III Performances, and 12 MAC Vipers. As a crucial element of the design, Cangemi relied on Martin’s MAC Aura to match the color temperatures of the daylight Par fixtures used on the cars and ensure the feature vehicles sparkled.